"Today’s volatile investing climate, the sea changes in technology, and shifting investor demographics provide a robust and multi-faceted training ground for tomorrow’s leadership talent"
BOSTON--(BUSINESS WIRE)--A majority of independent registered investment advisors (RIAs) are projecting firm growth in the year ahead, according to the results of the latest Independent Advisor Outlook Study (IAOS) from Schwab Advisor Services. The study - released today at Schwab’s annual IMPACT® conference - reflects responses from 638 RIAs, representing $209 billion in assets under management (AUM) custodied with Schwab, and reveals widespread optimism against the backdrop of the market downturn of the third quarter. Half of all advisors who participated in the study expect their firms to grow between five and 10 percent in the coming year, with 32 percent anticipating growth between 11-20 percent, and 15 percent projecting growth rates over 20 percent. Independent advisor confidence in the S&P 500 Index is at its highest point in three years, and 67 percent of advisors predict the S&P 500 will increase in the next six months. While confidence in the S&P 500 is high, advisors strongly agree that there will be continued market volatility (97%) and that geopolitics and global markets will adversely influence U.S. markets (80%) over the next six months. Looking back over the past six months, nearly all advisors (92%) reported the need to provide reassurance to at least some clients that their investment goals will be met, though it was generally a small number of clients (18% on average) – and represented the lowest level since wave two of this study in the fall of 20073. Technology continues to grow in influence and importance at RIA firms. Close to two-thirds (61%) of advisors say changes in technology are having a greater impact on their firms than changes in client demographics when they are asked about the two together. For larger firms - those with AUM of more than $500 million - the split is more pronounced with 67 percent of firms saying changes in technology trump changes in client demographics. The majority of advisors (68%) see technology adoption as central to their operational strategy, allowing them to spend more time with clients and achieve firm growth. Client expectations also influence technology adoption, with 43 percent in the study citing this as a driver, while 31 percent cite competitive necessity as a driver of technology adoption. Technology-led change is having an impact on firm talent and client relationships. When examining the shift in staff time allocation over the past five years, firms with projected growth rates of five percent or more report staff are spending more time implementing and learning to use new technology (58%). However, staff are also spending more time interacting with clients (52%) and less time doing manual data entry or generating reports (43%). With respect to automated investing specifically, among advisors who would recommend automated investing, the majority would recommend it for clients who don’t meet the firm’s asset minimums (70%) or clients with relatively simple investment needs (67%); half of advisors (54%) would recommend automated investing for children of existing clients or as a strategy to capture intergenerational wealth (24%). More than one third (37%) of advisors consider that up to 10 percent of their new client assets in the next year are likely to be appropriate for automated investment management, and an additional 21 percent say more than 10 percent of new assets are likely to be suitable. While firm growth is broadly anticipated, it is not without challenges. When asked to cite the growth challenges they face, advisors ranked a more complex compliance environment (41%), technology integration (39%) and establishing internal processes and balancing client services needs with business operational needs (both at 37%) as the top contenders. Advisors are experiencing change inside and outside their firms. Talent management (19%), an aging client base (18%), and technology (18%) are cited as the top three factors having the biggest impact inside RIA firms, followed closely by next generation firm leadership (15%). External forces such as the need for differentiation from other advice firms (22%) and regulation (21%) are reported as having the greatest impact outside firms. With respect to regulation, smaller firms – those with AUM of less than $500 million - feel the greatest regulatory impact (25%) as compared to 10 percent of larger firms. As changes unfold, three quarters of firms (74%) have identified the next generation of leaders and are actively preparing them to take the helm in the future by giving them hands-on exposure to business operations, technology and new client development learning experiences. Firms that are preparing next generation leaders are doing so on a number of fronts, including increasing their client-facing role with major clients (56%), allowing them to participate more in new business meetings or representing the firm with centers of influence or at third-party events (48%), providing more transparency about firm operations and finances (45%), assigning greater responsibility for development/management of junior staff (43%) and building out a new firm capability or rolling out a new technology (39%). 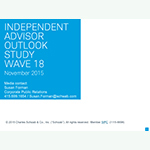 The Independent Advisor Outlook Study, conducted for Schwab Advisor Services by Koski Research, has a 3.65% margin of error. Koski Research is not affiliated with nor employed by Charles Schwab & Co. Inc. All data is self-reported by study participants and is not verified or validated. Advisors participated in the study between September 9 and September 18, 2015. Detailed findings can be found at www.aboutschwab.com/press/research. See the Institutional Intelligent Portfolios™ disclosure brochure for important information. Institutional Intelligent Portfolios™ is made available through independent investment advisors and is sponsored by Schwab Wealth Investment Advisory, Inc. ("SWIA"), a registered investment advisor. SWIA is an affiliate of Charles Schwab & Co., Inc. (“CS&Co.”) and is a subsidiary of The Charles Schwab Corporation. Schwab Advisor Services™ serves independent investment advisors and includes the custody, trading, and support of Charles Schwab & Co., Inc., Member SIPC. Independent investment advisors and Schwab are independent of each other and are not affiliated with, sponsored by, endorsed by, or supervised by each other.